Mrs. Wilma, a native of Illinois, is our teams insurance specialist. She has three daughters and two granddaughters, which she is very proud of: Denise, Susan, and Dr. Christina. She retired in October 2002 from Illinois State Police with thirty years of service. After retirement, she continued working in the insurance field, and stays active in the Illinois State Employees Retirement System. Wilma has been greatly educated on the benefits of chiropractic care while Dr. Christina, her daughter, was a student at Logan College of Chiropractic. Dr. Christina would continually call her so excited about all the information she was learning. Over the last several years, Wilma has become more aware of her own personal health and considers herself very fortunate when compared to others her own age. 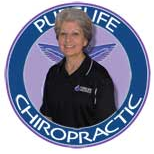 She feels very honored to have been invited to participate on this journey with PureLife Chiropractic. Wilma has decided to make Johnson City her permanent home.